Newsreel Daily News / A Chronicle of the day 1969 № 15 The Nazi murderers - to account! Five-Year Plan, the fourth year. Kinoreportazh. Art. Daily News / A Chronicle of the day 1969 № 15 The Nazi murderers - to account! Five-Year Plan, the fourth year. Kinoreportazh. Art. Operators: Konovalova S., Krichevskiy A., Mikhaylov L., Leongardt U., Monglovskaya G., Opryshko P., Tumorina R., Fedyaev E., Khavchin A., Khomyakov A., Shlykov P.
City of Moscow. International Conference on the prosecution of Nazi criminals. Speakers: Rudenko, S. Walczak (Poland), R. Shmitlen (France), B. Kucera (Czechoslovakia), J. Streit (GDR), K. Sauer (Germany), P. Sekkya (Italy). Melting steel in the shop of the West Siberian Metallurgical Plant. Steelmakers in the furnace. EA Furtseva and the Ambassador of the Hungarian People's Republic in the USSR Jozsef Sipko opened in Moscow exhibition "50 Years of the Republic of Hungary. The exhibition. Installation of the second unit Novovoronezh nuclear power plant. Assembling generator. Repair of tractors, combines, farm shop in the Kalinin Vinnitsa region. I. Prilipko worked as a mechanic, a blacksmith S. Fedoroisnyuk, turner N. Bursukovsky. Competitions on sport fishing in the Cup in Moscow on Mozhaiskom reservoir. Sportsmen, fishermen make holes in the ice, catch fish. P. Rogun - winner of the competition. 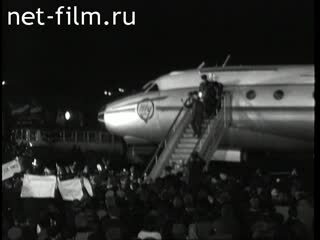 Meeting at the airport hockey team of the Soviet Union, won the title of world champions, on his return from Stockholm. City of Moscow, the Kremlin Palace of Congresses. A scene from an opera by Georges Bizet "Carmen" performed by the distinguished artist of Romania E. Black (synchronously). International Conference on the prosecution of Nazi criminals. Speakers: RA Rudenko, S. Walczak (Poland), R. Shmitlen (France), B. Kucera (Czechoslovakia), J. Streit (GDR), C. Sauer (Germany), P. Sekkya (Italy). 2. Steel melting shop in the West Siberian Metallurgical Plant. 3. The Moscow exhibition "50 years of the Hungarian People's Republic." EA Furtseva and Ambassador of the Hungarian People's Republic in the USSR Jozsef Sipko opens the exhibition. 4. Installation of the second unit of Novovoronezh nuclear power plant. The assembly of the generator. 5. Repair of tractors, combines, in the workshop of Kalinin Collective Farm Vinnitsa region. Mechanic work Prilipko I., Kuznetsov Fedoroisnyuk, turner N. Bursukovsky. 6. Competition in sport fishing in the Moscow Cup. Athletes fishermen make holes in the ice and fish. P. Rogun - winner of the competition. 7. Meeting at the airport returning from Stockholm hockey team of the USSR, who won the title of world champions. 8. Honored Artist of the Romanian opera singer in the opera E.Cherney Bizet's "Carmen."